If you're a side sleeper in need of great pressure relief or simply someone who prefers a soft yet supportive feel, the Queen size Sealy Posturepedic Response Performance Cooper Mountain IV Plush Pillow Top Mattress is a great way to go. The previous generation was one of the most popular mattresses not only from Sealy but on our site in general, and the newly improved version boasts several updates across the board. 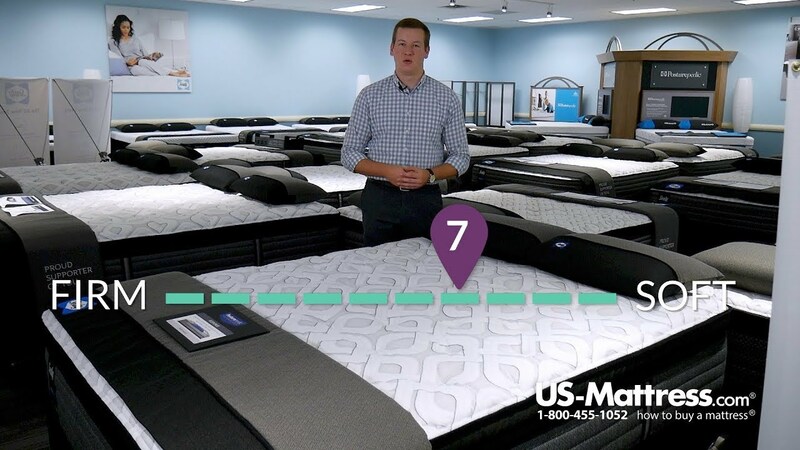 With a score of 7 on our Comfort Scale, this mattress offers a soft initial feel coupled with firm underlying support. Noteworthy improvements to the Cooper Mountain include the Comfort Loft Cover with MoistureProtect, a quilt designed to wick away moisture for a comfortably cool sleeping experience. Comfort is primarily provided through the premium polyurethane foams, which are all CertiPUR-US Certified. Expertly engineered to promote airflow, a layer of Sealy Air Foam provides some initial body contouring. A layer of SealyCushion Extra Soft Foam aids in soothing pressure points to reduce tossing and turning as well as promote good blood circulation. The SealyCool Gel Memory Foam layer located in the center third supplies additional support to the lower back, and it also encourages prolonged durability. Another layer of SealyCushion Extra Soft Foam guarantees deep down pressure relief, and it is specially designed to help side sleepers get the contouring that is necessary to avoid waking up with achy limbs. The Sealy Response Pro Encased Coil System provides support and utilizes a coil density of over 200 more coils than last year's version. This brilliant coil system is among the most forgiving on the market, and it contours well to your body's curves while simultaneously delivering deep down support. This system is particularly beneficial for couples and those who expect a pet to jump into bed because when movement occurs on one side very little motion is felt on the other. It's also fully compatible with an adjustable base. Among the best edge systems available, the DuraFlex Edge also represents an improvement in edge support technology. It allows you to sleep comfortably anywhere on the mattress without noticing much change in comfort or support. To sum up, if you prefer a soft feel this is one of the top choices available on our site. The attention to detail Sealy has given to this product is incredible and leaves nothing to be desired at this price point. This mattress comes complete with a 10-year warranty to ensure you are satisfied with your purchase. King 14" 76" 80" 96 lbs. Cal King 14" 72" 84" 96 lbs. Queen 14" 60" 80" 76 lbs. Full 14" 53" 75" 63 lbs. Twin 14" 38" 75" 45 lbs. Twin XL 14" 38" 80" 48 lbs. Overall, very pleased with mattress. The mattress was comfortable from the very first night, but once in awhile it will squeak on the edge when you get out of bed, and I’m not a huge person.??. I love my mattress. Good sleep every night. I been having this mattress for couple months now, I sleep much better it’s very comfortable, not to soft not to hard would definitely recommend it to anyone looking for something in between. Great mattress! Very happy with it. Very nice mattress. Comfortable and really like the pillow top. After 60 + years I finally have a mattress I love! Love this mattress. Not too soft but not too hard either. I sleep good every night and wake up with no more neck or baxk pain. In love with this mattress, so plush so fluff. I feel like I'm sleeping on a cloud. Deepest sleep I ever get with it. I thought it would be a little firmer. I finally have the perfect mattress! I love love this mattress! Best purchase ever!!!! Thank you! I didn't get that bed I got the beautyrest silver plush and I love it! Best bed I've ever had. Great purchase and follow up. Very professional local movers did the install. Would reccomend. We had a sleep number bed that was just not comfortable anymore. This mattress is wonderful, soft and love the pillow top. We are side sleepers and have been sleeping great. Delivery was quick and on time. Would highly recommend. Sealy Posturepedic Response Performance Cooper Mountain IV Plush Pillow Top is extremely comfortable! I have had it for a week now and have had the best sleeping in a very long time! Love this mattress. Came as scheduled and they set it up. Nice and tall with great pillow top. So far, very comfortable. Soft, but provides ample support in all positions. I recommend this mattress. Very comfortable mattress. I got 2 mattresses for my kids, and they sleep well on them. We are very please with the whole mattress buying experience. Everything went smoothly with the purchase and the delivery. The mattress is excellent. I've had many large pieces of furniture delivered over the years and never had such a quick, professional, stress free delivery. It took the two delivery men 7 minutes from when they entered my apartment with the new mattress and box spring, wrapped up the old mattress and box spring and set up the new mattress etc. After sleeping on the mattress for three weeks I am extremely happy with my purchase. The mattress is very high quality. When sleeping on my back the mattress totally supports me without sagging or swallowing me up. It holds me. And the mattress also makes sleeping on my side more pain free. I am very happy with my new mattress and with the ease, pricing and professionalism of buying from US Mattress. I have purchased 9 of these mattresses from your company over the last 10 years or so. Everyone that visits our homes in Florida (Destin and Naples), at Pickwick Lake, Counce, TN and our residence in Corinth, MS comments on how great and comfortable these mattresses are. Many have ordered the same mattress for their homes after their exposure while visiting our homes. And our experience with your delivery service has always been A-1. Mattress is firm but soft. Just right! Great quality, even better price! No more back and leg pain. Shipping was quick, easy and delivered in perfect condition. We had a firm mattress before this. I would toss and turn, wake up hurting and the sheets off the bed. Best sleep I’ve had in years. I bought the full size for my guest bedroom and it was so comfortable that I spent the night on it! Nice and plush with enough support for my back. My guest have loved it and one plans to purchase for her home. Great buy! US-Mattress did a fantastic job. I was very impressed with the over all service and communication. The third party delivery people were helpful, curtious and kept their delivery time. The mattress is super comfortable also. It is a little softer/splushier than I expected but I have slept on to for two weeks now and am very satiafied. If you are a larger/tall person that is a side sleeper I would check this mattress out. I never rested so well. get up in the morning wanting to climb back in. No more back or feet aches. Great price for Quality of the bed! US-Mattress has a repeat customer! Definitely a Good Quality Bed for sure! I was hoping it would’ve been a lil bit softer but that’s probably my own preference from my last Sealy Bed I had. I would recommend this bed! Great nights sleep since I got it delivered. The mattress is great and the service is also very good! We hope our guests appreciate this comfortable mattress. After 8 years it was time to get something new. I've been going to the chiropractor for 8 months with neck and back pain. After a month of sleeping on my new mattress all my aches and pains have gone away. Although the mattress is a little softer than anticipated, it is very comfortable. I am very happy with the purchase and hope it holds up well. This mattress is great! It doesn't jiggle my husband around much when I get in or out of bed, and it's supportive, and the pillowtop is plush and so comfortable! We are very happy with this purchase, and delivery was a breeze. I switched from sleep number to this and I have to say this is by far the most comfortable mattress I have owned in 10 years. It’s a great mix of soft and supportive. I’m sleeping much better these days. So far, I am very pleased. One of the softest beds I have ever slept on. Worth the purchase. I was nervous about buying a mattress online but there were so many positive reviews on the site I felt better about it. Now, 2 weeks in, I am in heaven. This mattress is so comfortable I look forward to going to sleep every night and I can't get up in the morning because I am so comfortable. The process was super easy and US Mattress delivered quickly. Would definitely recommend this bed and this site. Love my Plush Pillow top. Just enough cushion to stop my joints from aching upon waking. This is what i wanted and needed. MUCH better than the mattress it replaced! This is an awesome bed. A little too soft than I expected but it worked out great. Greatest bed I’ve had to date. Nice firm, solid feeling bed. Would highly recommend. Well worth the money for a quality product. The whole process was great! Very nice and comfortable. Height was a bit of a problem, and recommend getting a shorter box spring if you order this mattress. The bed was for my elder father and he loves it but has to use a step stool. Very good mattress. Quick shipping. Mattress & box springs shipped in boxes. My wife & I who are side sleepers sleep better than we have for years. I don't feel any movement when my wife gets up. I would recommend. Good experience US Mattress. No issues with delivery. Mattress is terrific. Soft above firm. Great for those that sleep in different positions. Super comfortable back and side sleeping. All around it’s a super deal. I recommend it!!! Great mattress that supports very well to help provide a good night’s sleep. I highly recommend. Great delivery. This bed is so comfortable!